Why do assessments matter for equity? 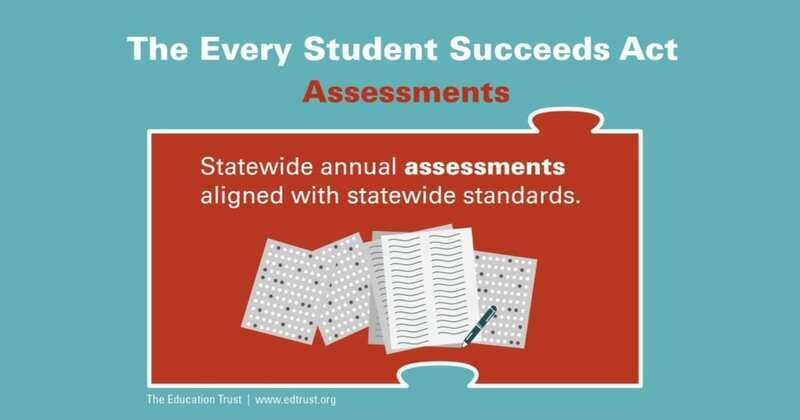 Statewide, annual assessments aligned with state standards are an important way of measuring student progress consistently across classrooms, schools, and districts.1 They provide parents with objective information about whether their children are academically ontrack. They help educators benchmark the performance of their students against those across the state. And they give parents and the public an objective measure of how schools are doing at improving learning for all groups of students. States have to test all students on statewide assessments in the following areas: reading/language arts and math every year in grades three through eight and once in high school; and science once between grades three and five, once between six and nine, and once again between 10 and 12. These tests must provide valid, reliable, and comparable information on whether all students are meeting state standards in each subject. States have to measure English learners’ progress toward English-language proficiency on statewide assessments given to all English learners annually. student’s native language for up to five years. can be used in the state’s accountability system. The U.S. Secretary of Education can establish a pilot program for states that want to develop innovative assessment systems, such as competency-based or performance-based assessments. Participating states can choose to initially try out these assessments in only some of their districts, but must use them statewide after successful piloting, or discontinue their use. These systems must also meet all the technical requirements of statewide assessments, including providing comparable data for all students. The law encourages states to review all the assessments they and their districts give in order to get rid of low quality or duplicative tests, and provides funding to states to support this process. Both the option to use a nationally recognized assessment at the high school level and the innovative assessment pilot introduce the possibility of students in different districts taking different tests. What safeguards need to be in place to ensure that these assessments are rigorous and truly comparable to statewide tests? Have states developed appropriate assessments for English learners, including assessments in the students’ native languages? How will they ensure that English learners are provided with the right assessment accommodations? How will states ensure that students with disabilities are provided with the right assessment accommodations? Have states developed appropriate alternate assessments for students with the most significant cognitive disabilities?